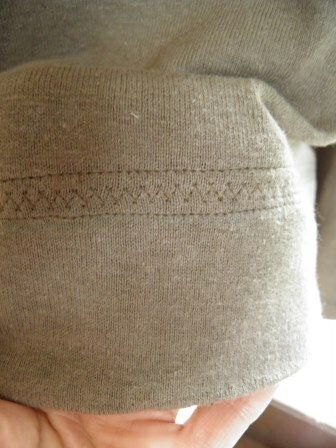 If you routinely hem knit garments using your sewing machine, consider combining several stitches to achieve a custom hem finish. In the example below, there are 2 rows of straight stitching on either side of a triple zig-zag stitch. Pretty, and very unique! 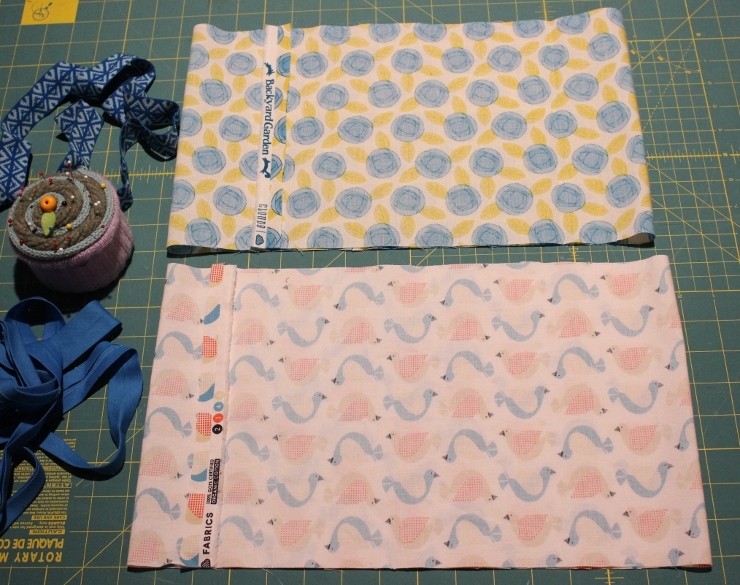 Try experimenting with the various stitch options on your sewing machine to see what you can create! Enjoy making these 2 pretty dresses, and wearing them in the City of Light! You might be wondering why I made a dress for which I didn’t have very high expectations. 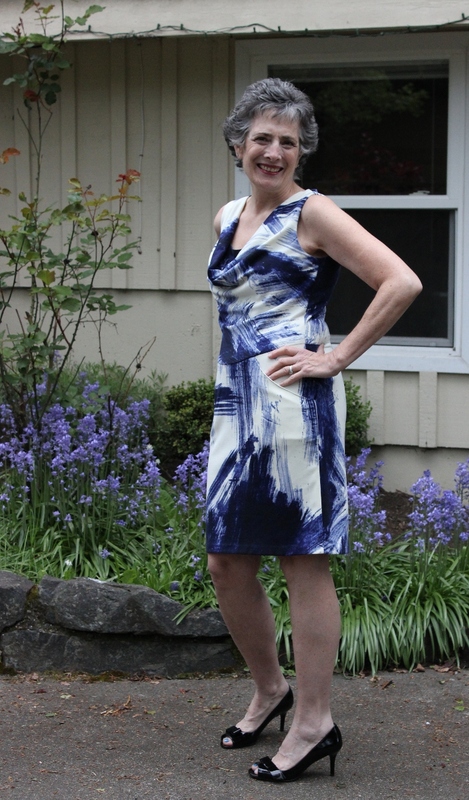 I actually did think Vogue 8873 was a really cute dress design, and I am kind of crushing on cowls right now, and I wanted to use a piece of insanely-gorgeous fabric from EmmaOneSocksome great fabric store…..so I was initially sure the finished product was going to be lovely. Somehow, don’t ask me how because I can’t explain it, I didn’t realize until the project was underway that the waistline was dropped below the natural waist. Yes, the technical drawing/pictures give a hint of this. Yes, the front bodice darts indicated this. But somehow I was not paying enough attention. And a dropped waist on a high-hipped lady usually spells trouble. So I fretted and stewed. Worried that I was putting effort into something that was not going to be wearable. Worried I was “wasting” my beautiful fabric. Worried that my all-too-precious sewing time was being wasted. So I constructed the dress front and the dress back, and basted the side seams together. I tried it on. And I was stunned. Stunned, I tell you. It worked on my figure! It fit perfectly! It was not wasted effort in any way! And since I have at least one wedding to attend this summer I now have a pretty new dress to wear that makes me feel all flirty and feminine. Winner-winner chicken-dinner! The fabric is a super comfy ponte in an inky navy blue paintbrush print. I fell in love with this fabric and ordered several yards (how many months ago? ), not knowing for certain what it wanted to become. When I saw Vogue 8873 it was a natural pairing. The instructions call for this dress to be lined, but I didn’t have any stretchy lining in my stash, and couldn’t find any tricot when I made a feeble attempt to find a suitable lining. I took a risk that the lining was not required. That decision did require binding the armhole with ivory bias Ambiance; easy-peasy. I also lined the pockets with the same ivory Ambiance. I made my usual “petite above the waist” adjustment, and lengthened the skirt by almost 2 inches. (Thanks be to God, since it ended barely at my knees!) Other than that, a straight size 14. 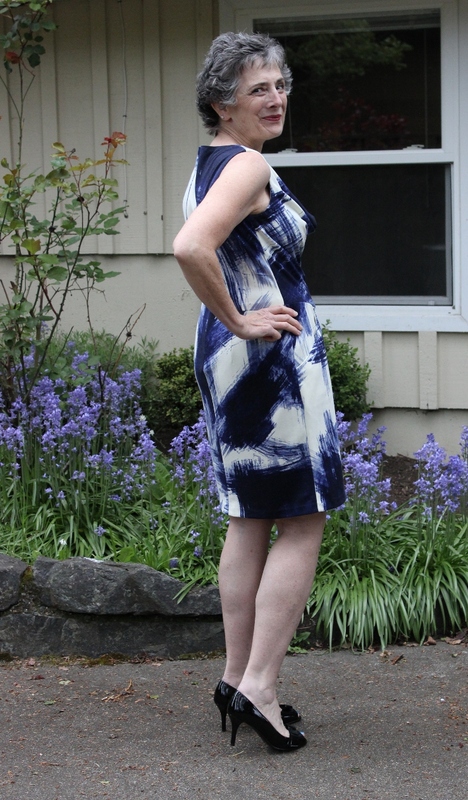 This dress is very easy to sew, and I am thinking about making another version with the bias skirt, maybe in a floaty rayon fabric? In the meantime, I plan to wear the heck out of this pretty frock! It’s time some of you lovelies benefited from my overflowing pattern stash. Look at these 2 beauties! Both of these patterns are uncut and in their original envelopes. Vogue 1174 (OOP) includes sizes 12-14-16-18, and Vogue 1161 (OOP) includes sizes 14-16-18-20. Evidently I unfolded Vogue 1174 at one time (who knows why?? ), but I checked and all the tissue is uncut—just not in the factory folds. I think you can deal. Plus I’m also throwing in a pair of Somore scissors, and a package of assorted needles and a tape measure. You can always use extras of those, right? Leave me a comment no later than 9:00 a.m. Monday, April 28th – I want to hear where you plan to wear these dresses or what fabric you are dreaming of using. I will either pick randomly, or I might decide to pick my favorite comment – so be creative! Join the American Sewing Guild (ASG). Plenty of educational opportunities + SEWING SISTERS!! From their web site: ” ASG is a membership organization that welcomes sewing enthusiasts of all skill levels and from many different walks of life. Chapters are located in cities all across the country and members meet monthly to learn new sewing skills, network with others who share an interest in sewing and participate in community service sewing projects…” Disclaimer: I belong to ASG and think it is the best thing since sliced bread. Start a local chapter of ASG if one doesn’t exist in your locale. 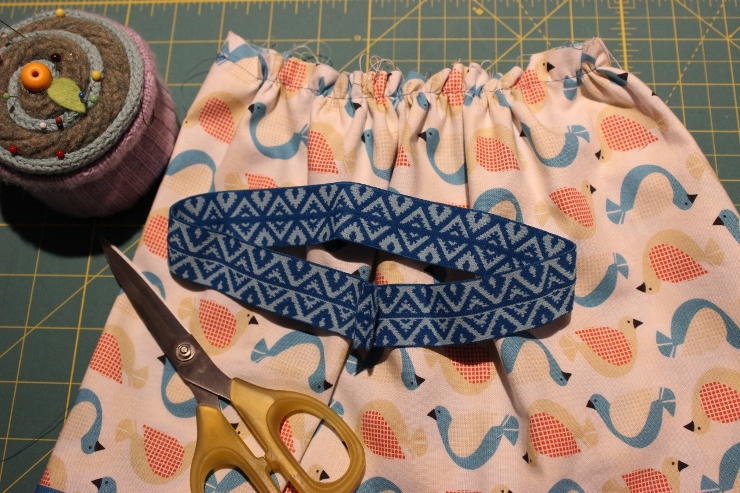 It is a good bet there are others-you-have-yet-to-meet who are itching to connect with sewing enthusiasts such as yourself. Read a book. O.M.G. 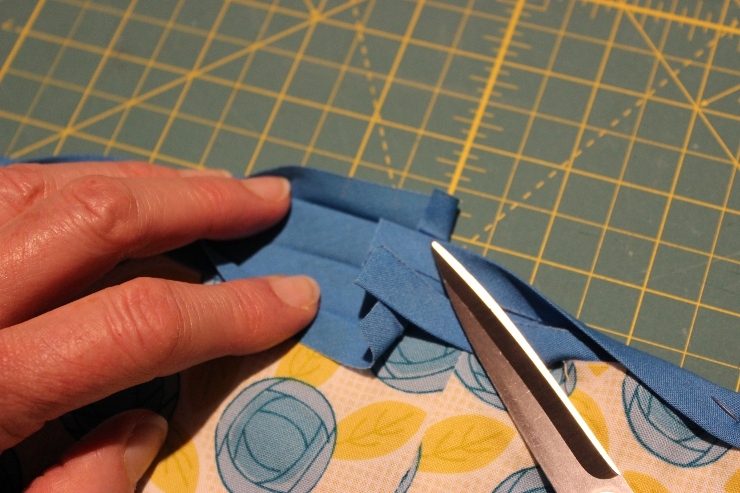 There are so many awesome sewing books that will help you improve your skills. Check out my recommended sewing books short list – but definitely do not stop there. Go to the library first, and then go nuts on Amazon. Or garage sales. Follow sewing blogs. 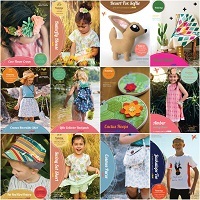 There are “sew many” awesome blogs out there for children’s clothing, quilting, bags, adult garments—you name it, you are likely to find a blog about it. Watch videos. There is a YouTube video on how to do EVERYTHING, amiright? Threads offers a selection of free videos, and BurdaStyle.com also offers tutorials with videos. 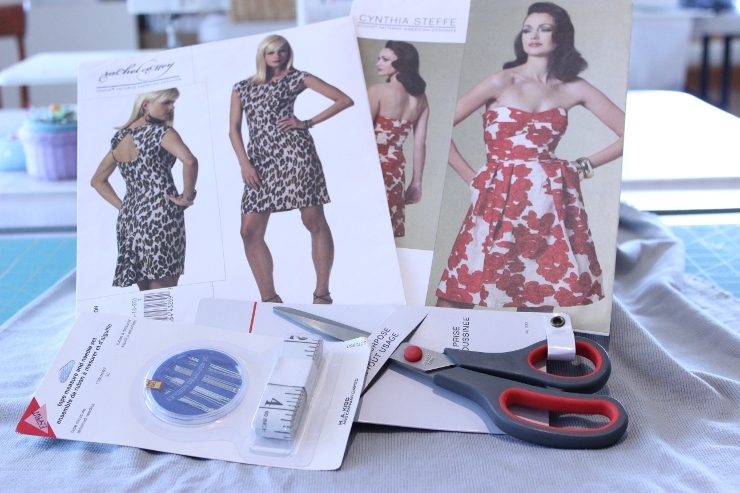 What other sites do you like for online sewing video help? 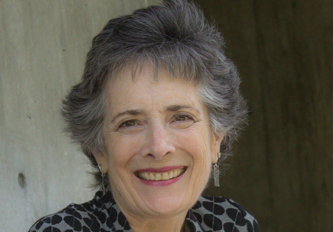 Sign up for an online class. Just to name two, Craftsy.com and PatternReview.com both offer online classes (most for a fee). Watch a sewing techniques DVD. There are piles of sewing DVDs available from my local library. Have you checked your library’s collection? Of course there are plenty of purchasing opportunities as well. Go to a sewing meetup. If you aren’t familiar with meetups, they are a quick and easy way to find people with similar interests. 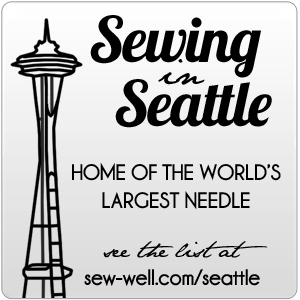 Search for “sewing” meetups in your area, or start one yourself! Join a sewing site. Some of the biggies are PatternReview.com, BurdaStyle.com, and Artisan’s Square (Stitcher’s Guild). Join discussions in these online forums and you will find piles of folks who generously give of their time and sewing talents. Practice. 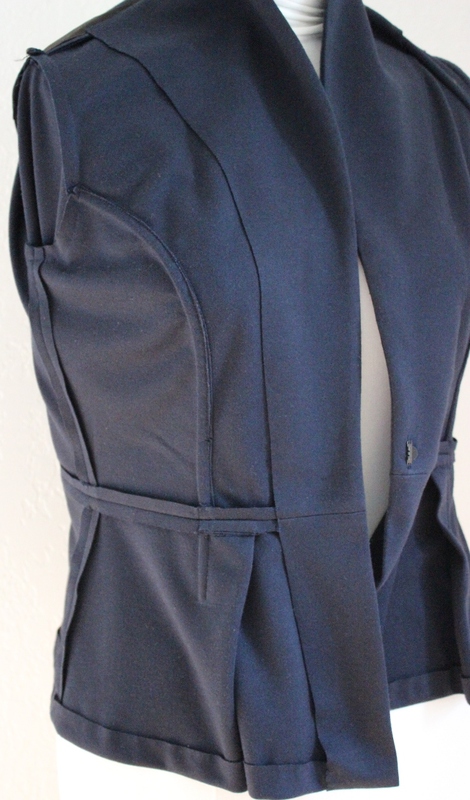 Don’t be discouraged if your invisible zipper doesn’t look perfect the first time! The first time you jumped in a swimming pool you weren’t able to swim a pool length with perfect crawl stroke form, either. 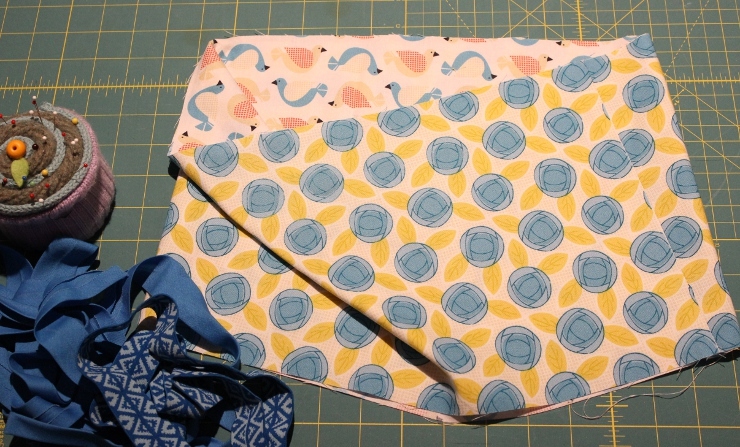 Get a pile of scrap fabric, and start working on your techniques. If you put an invisible zipper in 10 times I’m pretty sure the 10th will be better than the first. Buy accessory presser/feet or tools that will help make tricky jobs easier. If you read my blog at all, you know I LOVE my presser feet. I probably buy too many, but I am supporting my local dealer/economy. 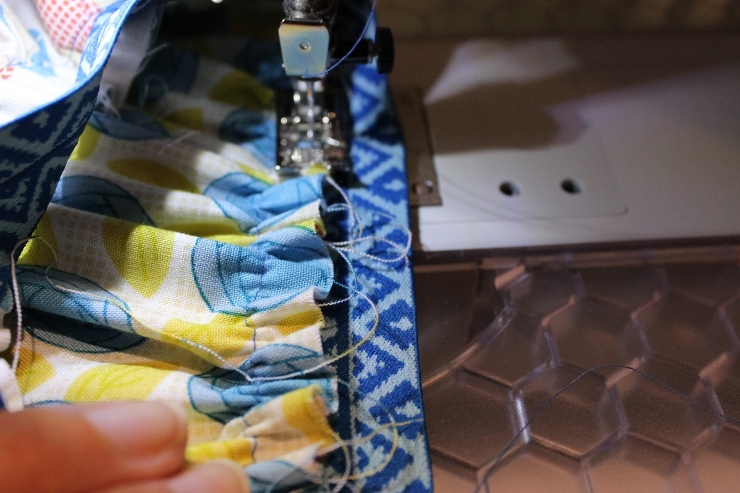 Start with those sewing jobs you know you do frequently. Always topstitching something? Buy an edgestitch foot. Like to make blue jeans? Buy a jeans foot. Always put invisible zippers in your skirts? Buy an invisible zipper foot (and I DON’T mean the generic package of crappy plastic parts from the fabric store!). Can’t get enough pintucked, heirloom dresses for little girls? Buy a pintuck foot. You get the idea. 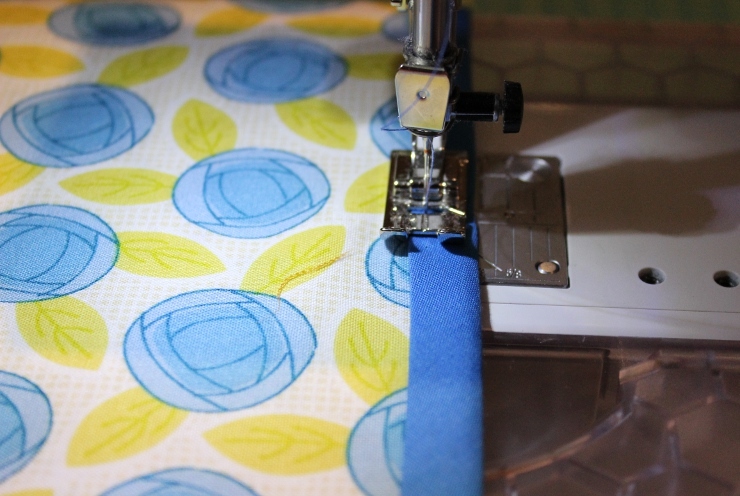 Do you sometimes have trouble threading your sewing machine, especially at night? Try placing a small piece of “bright white” paper right behind the needle. You will be amazed at how much more visible the eye of the needle becomes! The next time you are struggling with threading, try this simple trick and see if it helps you, too. 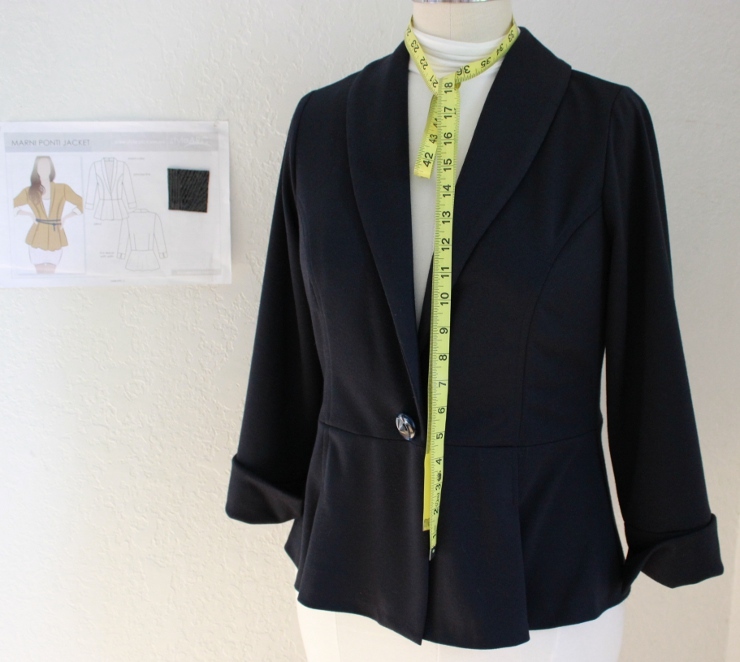 Quick construction process, forgiving fabric to sew with, great design details—what’s not to love about Style Arc’s Marni Ponti Jacket! Have you tried making your own version yet? I am a sucker for peplums because I think they cover a multitude of sins, PLUS they are pretty and feminine. They were still all over the runway in this spring’s fashion shows, as well as still appearing in some of the Big Four pattern designs. A little flouncy in the back, two topstitched pleats in the front, and you have a jazzy little peplum most would love wearing. The 3/4 sleeves on this light jacket are my “sleeve length de rigueur”. (Pretty much as soon as I became a mother I dumped long sleeves for 3/4 length; it really reduced the number of garments coated with spaghetti sauce, amiright?) Details, ladies, it is all in the details, and I love pretty much all of them on this jacket. 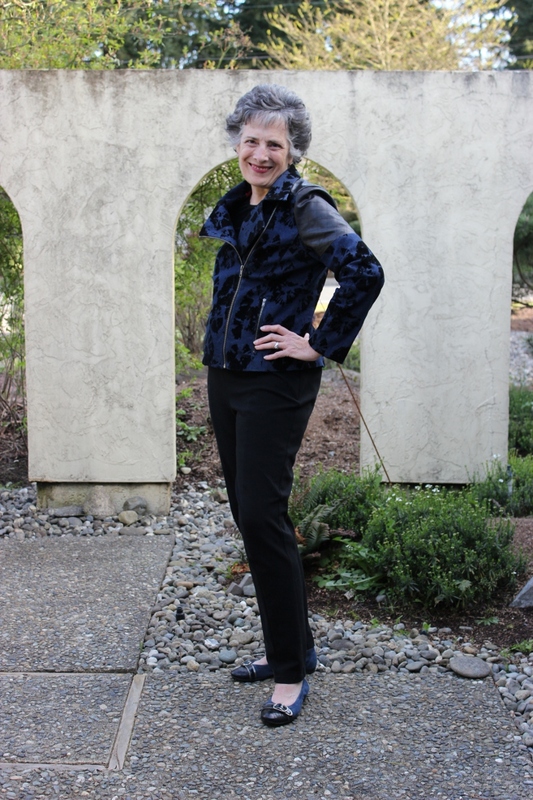 I made my Marni from a fairly lightweight inky navy ponte in my stash. In retrospect I wish it had a touch more body, but I will wear it for a while and see how I like it. Although it is called a jacket, in a lighter weight fabric it is almost a cardigan. Oh, and the only fitting adjustment I made was to petite the upper body by 3/8 of an inch. Easy peasy. The back is very simple, tho I do love the cuff turnback. Just right for showing off some of my silver bracelets! 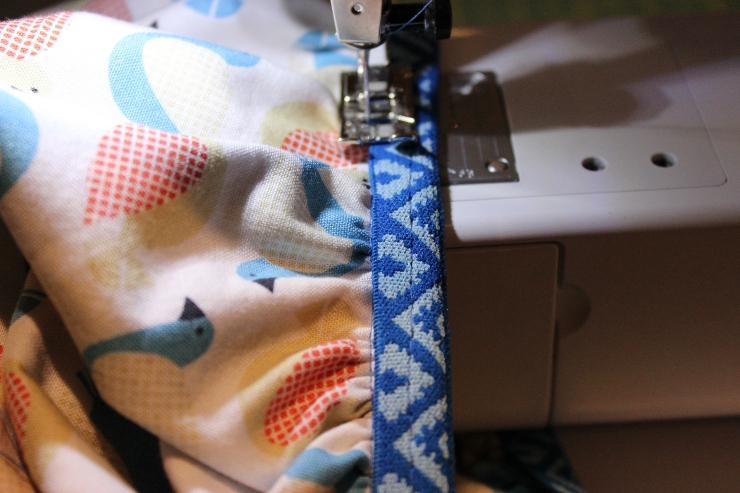 The pattern specified a large hook and eye closure, and as you can see in the pattern cover, it is styled with a belt. Well, I know me, and while a belt probably WOULD look great on this jacket, a single good-looking button simplifies both dressing and wearing. I really hate adjusting and fiddling with clothes on my body; I prefer the “throw on and go” approach. Besides, this button is PURRR-fect. No buttonhole, just a single button for another finishing detail, and a hook and eye closure underneath. Now let’s take a peek inside. 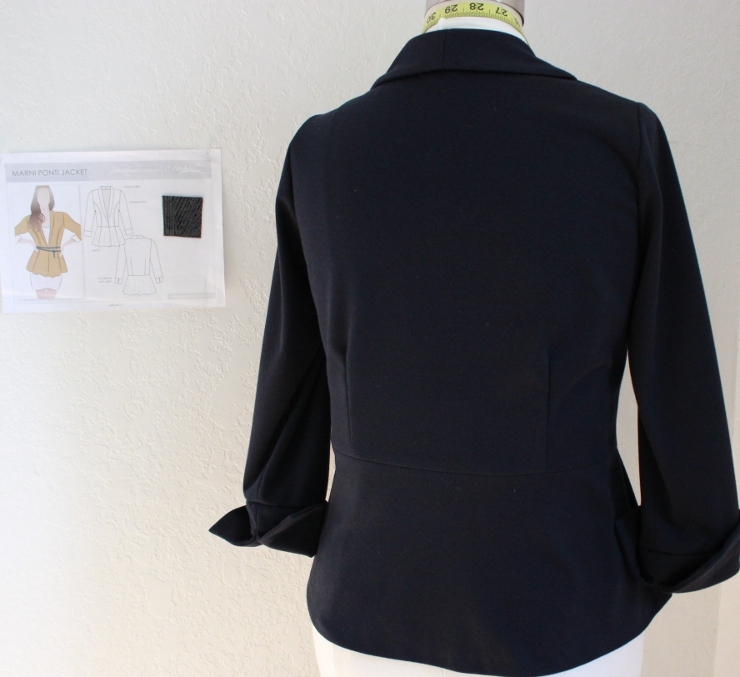 You can see I stitched the entire jacket on my sewing machine—no serging. It just felt like too much thread for the design + fabric. 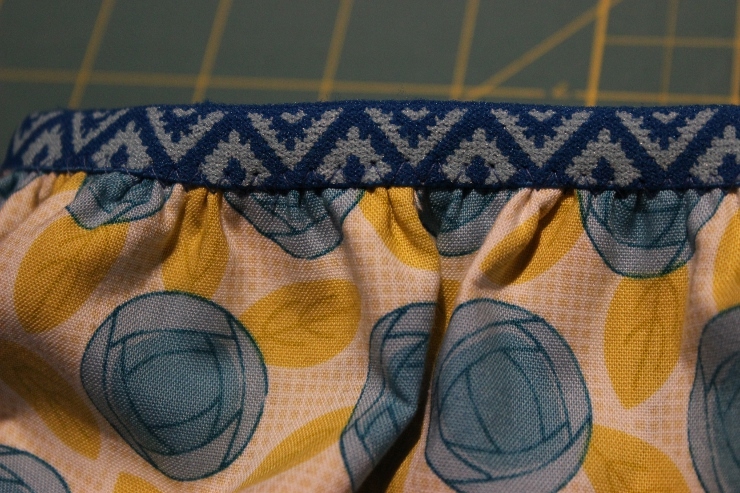 I am pretty sure my stitch width was set to 1.0 and length to 3.0 (or maybe 3.5). 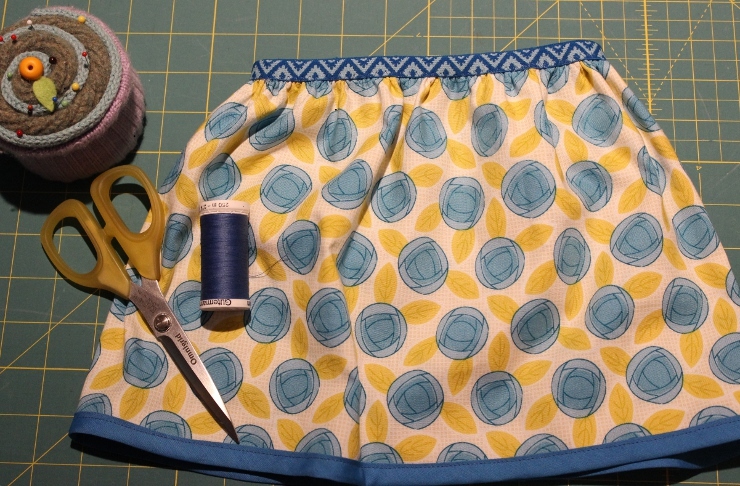 The topstitching on the front princess seam + peplum pleat holds those seam allowances where they belong, and I did a blind catch stitch on the hem and all the way up the front facing to hold those edges in place. Remember, soft knits want to slide around, so I am much happier now with the roll of the shawl collar all the way down the front of the jacket. It just took a little fabric-bossing to get everyone in line. Oh, and a little seam binding up top to stay the shoulders, and that’s about it, folks. This is a case where Style Arc DOES = EASY. 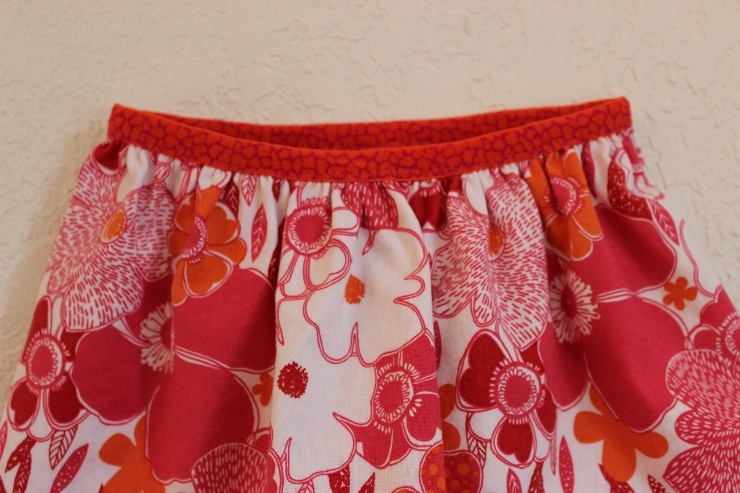 Just a little teaser….there IS more on the way for this ensemble. 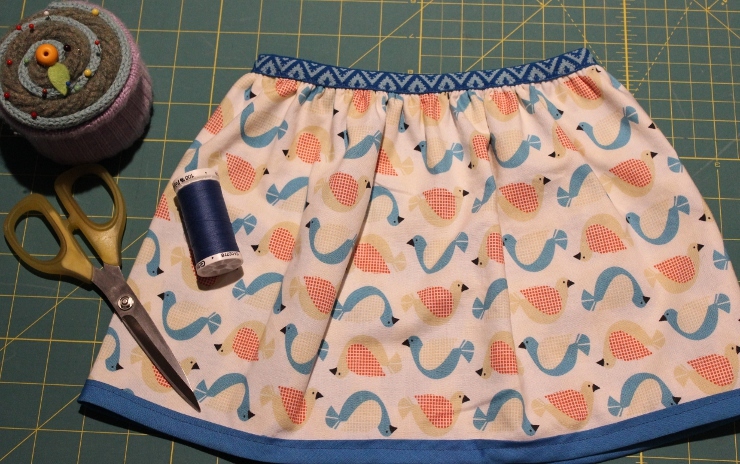 If I could only get a little more time under the sewing machine! 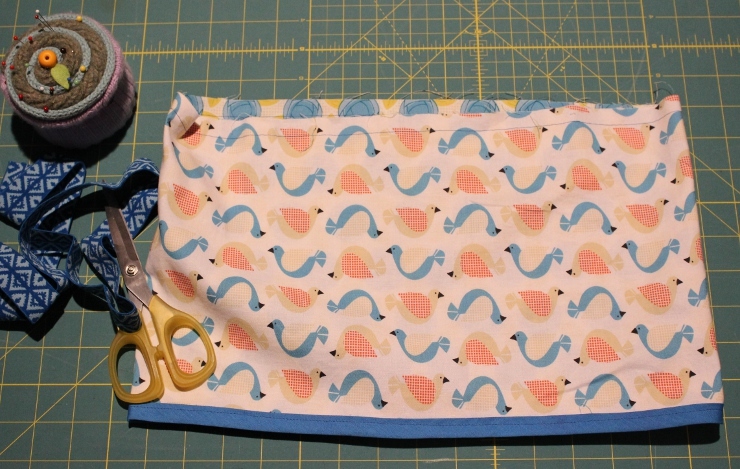 For my money, sewing clothes for little ones must be quick-to-make and stinkin’ cute. 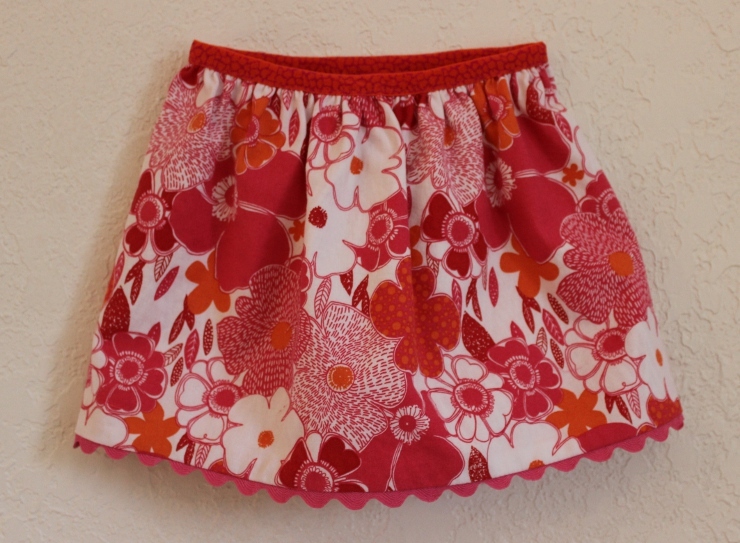 I am pretty sure this little skirt qualifies, and BONUS! It is reversible! 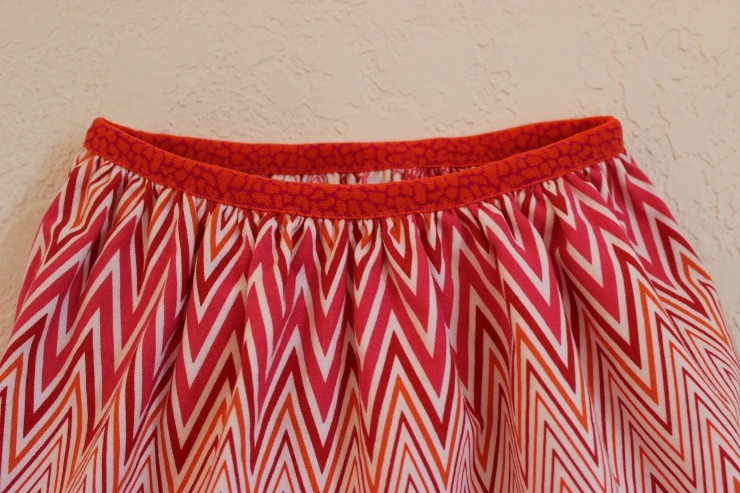 I love the bright color palette of this variegated chevron fabric. 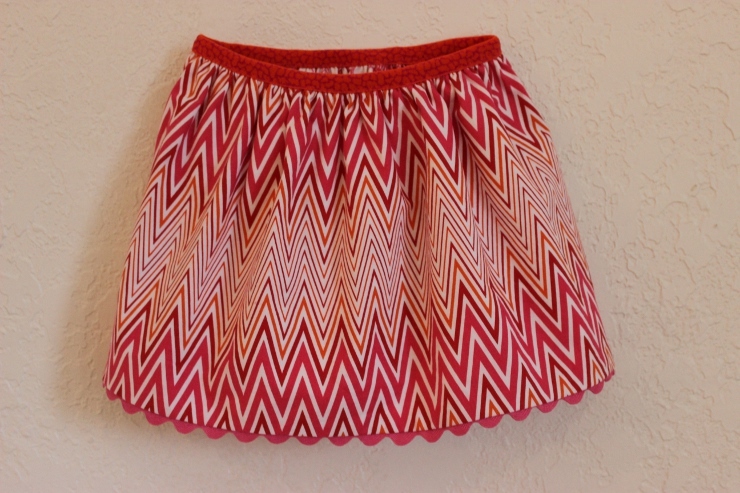 Just add a bit of rick rack and print FOE, and you have an almost-instant-skirt. 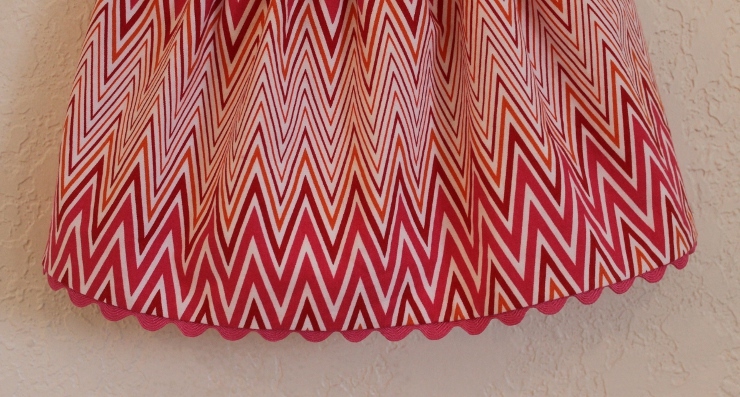 Doesn’t that orange and pink elastic just set off the colors in the fabric? I adore rick rack on children’s clothes. It’s a little retro, but modern and fresh at the same time. Can’t.get.enough.rick.rack. And if the chevrons weren’t enough, this bold floral is screaming “SPRINGTIME”! Sorry. Just wanted you to see that adorable rick rack again. Alright my pretties, StacySews and I have heard you. You need a little more time. 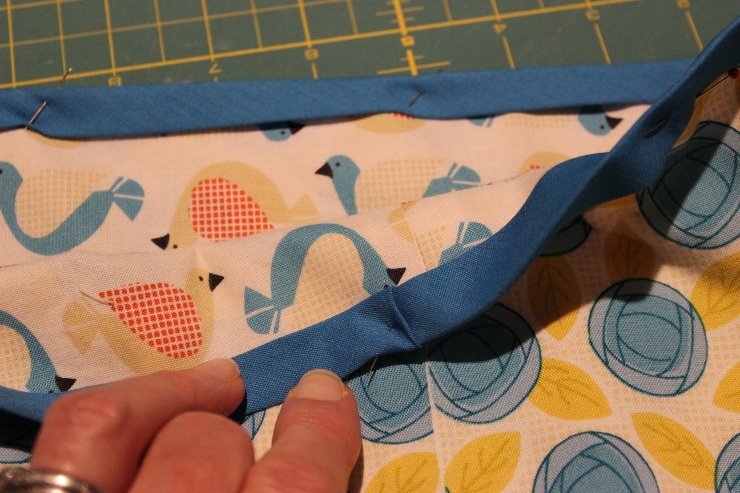 Life can certainly get in the way of the all-important-sewing sometimes; we understand that. Don’t forget to post pictures of your completed Ziggi on the Flickr group. Let the world see your Ziggi awesome-ness!